Relying on the conventional manned Weigh Bridges is a matter of past. Relying on the conventional manned Weigh Bridges is a matter of past. In order to have full proof Weighment of your valuable factory Input & output materials you need to automate & have a system having no manual intervention. We have developed value added Manless Weighing Solutions for Our clients based on RF ID Technology. RFID tag is mounted on the wind screen of the truck. There are Automatic Boom Barriers all across the plant. The Truck is allowed to move only to the designated areas. 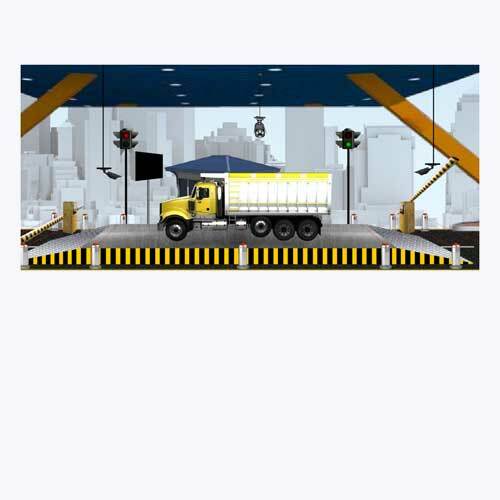 At Weigh Bridge weighment is done automatically & the data is updated to the SAP. All required accessories like Boom Barriers, Traffic Signals, RF ID Cards, Control Panels, RF ID Readers are manufactured in house. We supply Weigh bridges in all capacities & sizes. We are having number of Weigh Bridge Installations throughout the country.